Pilates training, initially developed to keep professional ballet dancers in shape, focuses on core strength, but also trains the body as an integrated whole. Pilates workouts promote strength and balanced muscle development as well as flexibility and increased range of motion for the joints. Level 1 classes are for newer students to learn correct alignment and breathing in fundamental yoga postures. 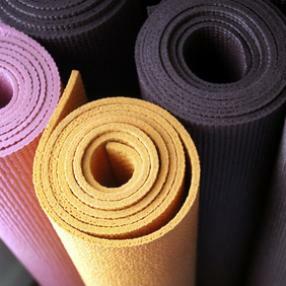 These classes are ideal for those who are brand new to yoga, or have minimal yoga experience. All Levels Flow in a warm studio! Vinyasa style class. Showing level 1 - level 3 variations to all poses. Work at your own level and your own pace. Playful style class beginning with core work and ending with playtime for inversions. Well rounded class or working to a peak pose each week! You will work on the alignment of poses, while slowly moving, focusing on linking mindful breath with movement. This practice is suitable for beginners. Easy program for cultivating & maintaining a strong foundation. Kripalu Yoga puts a great emphasis on the mechanics of Yoga - proper breath and alignment - as well as in the inner, spiritual dimensions of Yogic practice. In this all-levels class, students are encouraged to honor "the wisdom of the body" and to work according to the limits of their individual flexibility and strength. Align to Flow (Level 1) practice will flow with alignment and then with breath. The practitioner will build strength, flexibility, and breath to help their practice grow and deepen.